Distribution of Slavic languages in Europe. Slavs are the largest Indo-European ethno-linguistic group in Europe. They are native to Central Europe, Eastern Europe, Southeastern Europe, Northeastern Europe, North Asia and Central Asia. 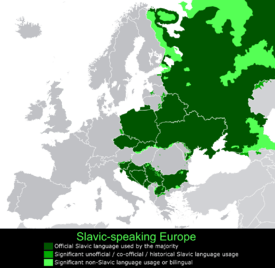 Slavs speak Indo-European Slavic languages. From the early 6th century they spread to inhabit most of Central, Eastern and Southeastern Europe. States with Slavic-based languages comprise over 50% of the territory of Europe. Present-day Slavic people are classified into West Slavs (chiefly Poles, Czechs and Slovaks), East Slavs (chiefly Russians, Belarusians, and Ukrainians), and South Slavs (chiefly Serbs, Croats, Bosniaks, ethnic Macedonians, Slovenes, and Montenegrins of the Former Yugoslavia as well as Bulgarians). For a more comprehensive list, see the ethnocultural subdivisions. Modern Slavic nations and ethnic groups are considerably diverse both genetically and culturally, and relations between them – even within the individual ethnic groups themselves – are varied, ranging from a sense of connection to mutual feelings of hostility. The Slavic autonym *Slověninъ is usually considered a derivation from slovo ("word"), originally denoting "people who speak (the same language)," i.e. people who understand each other, in contrast to the Slavic word denoting "foreign people" – němci, meaning "silent, mute people" (from Slavic *němъ – "mute, mumbling"). The word slovo ("word") and the related slava ("glory, fame") and slukh ("hearing") originate from the Proto-Indo-European root *ḱlew- ("be spoken of, glory"), cognate with Ancient Greek κλῆς (klês – "famous"), whence comes the name Pericles, Latin clueo ("be called"), and English loud. Around the 6th century, Slavs appeared on Byzantine borders in great numbers. The Byzantine records note that grass would not regrow in places where the Slavs had marched through, so great were their numbers. After a military movement even the Peloponnese and Asia Minor were reported to have Slavic settlements. This southern movement has traditionally been seen as an invasive expansion. By the end of the 6th century, Slavs had settled the Eastern Alps regions. During World War II, Nazi Germany entailed killing, deporting, or enslaving the Slavic and Jewish population of occupied Eastern Europe to create Living space for German settlers, and also planned the starvation of 80 million people in the Soviet Union. These partially fulfilled plans resulted in the deaths of an estimated 19.3 million civilians and prisoners of war. The West Slavs have origin in early Slavic tribes which settled in Central Europe after East Germanic tribes had left this area during the migration period. They are noted as having mixed with Germanics and Balts. The West Slavs came under the influence of the Western Roman Empire (Latin) and of the Roman Catholic Church. The East Slavs have origins in early Slavic tribes who mixed with Finno-Ugric peoples and Balts. Their early Slavic component, Antes, mixed or absorbed Iranians, and later received influence from the Khazars and Vikings. 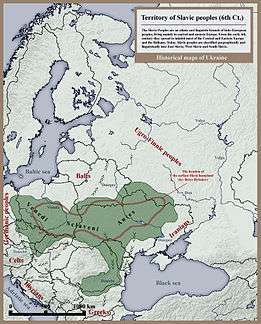 The East Slavs trace their national origins to the tribal unions of Kievan Rus', beginning in the 10th century. They came particularly under the influence of the Eastern Roman Empire (Byzantine Empire) and of the Eastern Orthodox Church; Eastern Catholic Churches later became established in the 16th century in areas such as Ukraine. The South Slavs from most of the region have origins in early Slavic tribes who mixed with the local Proto-Balkanic tribes (Illyrian, Dacian, Thracian, Pannonian, Paeonian and Hellenic tribes), Celtic tribes (most notably the Scordisci), as well as with Romans (and the Romanized remnants of the former groups), and also with remnants of temporarily settled invading East Germanic, Asiatic or Caucasian tribes such as Gepids, Huns, Avars and Bulgars. 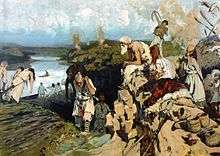 The original inhabitants of present-day Slovenia and continental Croatia have origins in early Slavic tribes who mixed with Romans and romanized Celtic and Illyrian people as well as with Avars and Germanic peoples (Lombards and East Goths). The South Slavs (except the Slovenes and Croats) came under the cultural sphere of the Eastern Roman Empire (Byzantine Empire), of the Ottoman Empire and of the Eastern Orthodox Church and Islam, while the Slovenes and the Croats were influenced by Western Roman Empire (Latin), Holy Roman Empire and, thus by the Roman Catholic Church. ^1 The ethnic classification is disputed. See main article for further information. ↑ Barford 2001, p. 1. ↑ Encyclopædia Britannica (18 September 2006). 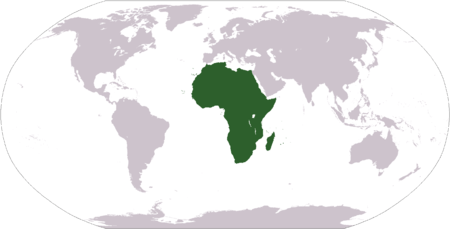 "Slav (people) – Britannica Online Encyclopedia". Britannica.com. Retrieved 18 August 2010. ↑ Robert Bideleux; Ian Jeffries (January 1998). A History of Eastern Europe: Crisis and Change. Psychology Press. ISBN 978-0-415-16112-1. ↑ "Нас 150 миллионов -Русское зарубежье, российские соотечественники, русские за границей, русские за рубежом, соотечественники, русскоязычное население, русские общины, диаспора, эмиграция". Russkie.org. 20 February 2012. Retrieved 29 April 2013. ↑ Paul R. Magocsi (2010). A History of Ukraine: The Land and Its Peoples. University of Toronto Press. pp. 10–. ISBN 978-1-4426-1021-7. ↑ "Serbs around the World by region" (PDF). Serbian Unity Congress. 2013. Archived from the original (PDF) on 5 December 2013. ↑ "Tab. 6.2 Obyvatelstvo podle národnosti podle krajů" [Table. 6.2 Population by nationality, by region] (PDF). 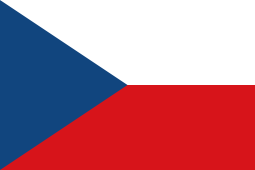 Czech Statistical Office (in Czech). 2011. Archived from the original (PDF) on 31 January 2012. ↑ The Report: Bulgaria 2008. Oxford Business Group. 2008. p. 8. ISBN 978-1-902339-92-4. Retrieved 26 March 2016. ↑ Karatnycky, Adrian (2001). Freedom in the World: The Annual Survey of Political Rights and Civil Liberties, 2000–2001. Piscataway, NJ: Transaction Publishers. p. 81. ISBN 978-0-7658-0884-4. Retrieved 7 June 2015. ↑ "Hrvatski Svjetski Kongres". Archived from the original on 2003-06-23. Retrieved June 1, 2016. , Croatian World Congress, "4.5 million Croats and people of Croatian heritage live outside of the Republic of Croatia and Bosnia and Herzegovina"
↑ National Minorities in Inter-State Relations. 14 February 2011. Retrieved 29 April 2013. ↑ Nasevski, Boško; Angelova, Dora; Gerovska, Dragica (1995). Матица на Иселениците на Македонија [Matrix of Expatriates of Macedonia] (in Macedonian). Skopje: Macedonian Expatriation Almanac '95. pp. 52–53. ↑ Jordanes, The Origin and Deeds of the Goths, V.33. ↑ "Procopius, History of the Wars, VII. 14. 22–30". Clas.ufl.edu. Retrieved 4 April 2014. ↑ Jordanes, The Origin and Deeds of the Goths, V. 35. ↑ Maurice's Strategikon: handbook of Byzantine military strategy, trans. G.T. Dennis (1984), p. 120. ↑ Curta 2001, pp. 91–92, 315. ↑ Cyril A. Mango (1980). Byzantium, the empire of New Rome. Scribner. ISBN 978-0-684-16768-8. ↑ "Austria-Hungary". MSN Encarta. Archived from the original on 20 August 2009. ↑ Stephen J. Lee (2000). 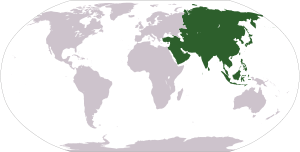 "European dictatorships, 1918–1945". Routledge. p.86. ISBN 0-415-23046-2. 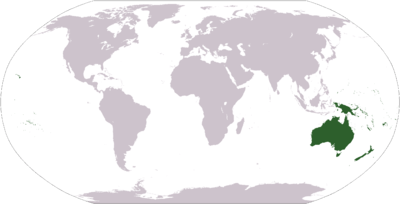 ↑ F. Kortlandt, The spread of the Indo-Europeans, Journal of Indo-European Studies, vol. 18 (1990), pp. 131–140. Online version, p.4. ↑ F. Kortlandt, The spread of the Indo-Europeans, Journal of Indo-European Studies, vol. 18 (1990), pp. 131–140. Online version, p.3. ↑ J.P. Mallory and D.Q. Adams, The Oxford Introduction to Proto-Indo-European and the Proto-Indo-European World (2006), pp. 25–26. ↑ Kobyliński, Zbigniew (1995). "The Slavs". In McKitterick, Rosamond. The New Cambridge Medieval History: Volume 1, C.500-c.700. The New Cambridge Medieval History. 1, C.500-c.700. Cambridge University Press. p. 531. ISBN 9780521362917. ↑ Roman Smal Stocki (1950). 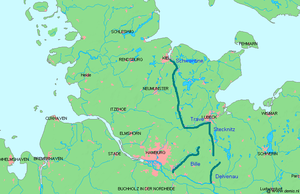 Slavs and Teutons: The Oldest Germanic-Slavic Relations. Bruce. ↑ Raymond E. Zickel; Library of Congress. 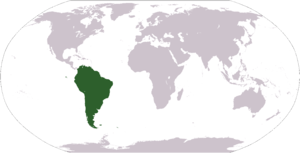 Federal Research Division (1 December 1991). Soviet Union: A Country Study. Federal Research Division, Library of Congress. p. 138. ISBN 978-0-8444-0727-2. ↑ Comparative Politics. Pearson Education India. pp. 182–. ISBN 978-81-317-6033-8. ↑ Vlasto 1970, p. 237. ↑ Balanovsky, O; Rootsi, S; Pshenichnov, A; Kivisild, T; Churnosov, M; Evseeva, I; Pocheshkhova, E; Boldyreva, M; et al. (2008). "Two Sources of the Russian Patrilineal Heritage in Their Eurasian Context". AJHG. 82 (1): 236–250. doi:10.1016/j.ajhg.2007.09.019. PMC 2253976 . PMID 18179905. 1 2 A Country Study: Hungary. Federal Research Division, Library of Congress. Retrieved 6 March 2009. ↑ Klyuchevsky, Vasily (1987). The course of the Russian history. v.1: "Myslʹ. ISBN 5-244-00072-1. Retrieved 9 October 2009. ↑ Shore, Thomas William (2008). Origin of the Anglo-Saxon Race – A Study of the Settlement of England and the Tribal Origin of the Old English People. READ BOOKS. pp. 84–102. ISBN 1-4086-3769-3. ↑ Lewis (1994). "Lewis 1994, ch 1". Archived from the original on 1 April 2001. ↑ Eigeland, Tor. 1976. "The golden caliphate". Saudi Aramco World, September/October 1976, pp. 12–16. ↑ "Wend – Britannica Online Encyclopedia". Britannica.com. 13 September 2013. Archived from the original on 2008-05-07. Retrieved 4 April 2014. ↑ "Polabian language". Britannica.com. Retrieved 4 April 2014. ↑ "Contemporary paternal genetic landscape of Polish and German populations: from early medieval Slavic expansion to post-World War II resettlements". European Journal of Human Genetics. 2013. PMC 3598329 . ↑ "Y-chromosomal STR haplotype analysis reveals surname-associated strata in the East-German population". European Journal of Human Genetics. 2006. Retrieved 25 January 2006. "Slavs". The New Student's Reference Work. 1914. Leopold Lénard (1913). "The Slavs". In Herbermann, Charles. Catholic Encyclopedia. New York: Robert Appleton Company.